This is a great game. 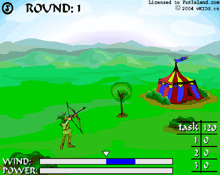 With a bow and arrow, you will try to shoot as far as possible. You need to make sure that the wind is blowing your way and that you have the right angle to make it go as far as possible. Each level will increase the distance you need to pass.